Description: This volume celebrates the discovery of the Dead Sea Scrolls, their contents, the community that wrote and preserved them, and new scientific issues that arise from Scrolls studies. The essays, in four sections, explore the origins and text of scripture, the interpretation of scripture in Second Temple Judaism, the identity and practices of the movement associated with Qumran and the Scrolls, and the extensive contributions of Canadian projects and scholarship. Eight color plates are included in the volume. The contributors are Eileen Schuller, Jason Kalmon and Jaqueline S. du Toit, Jean Duhaime, Andrew B. Perrin, Benjamin H. Parker, Peter W. Flint and Kyung S. Baek, Eugene Ulrich, Manuel Jinbachian, Martin G. Abegg Jr., Emanuel Tov, Steve Mason, Daniel K. Falk, Wayne McCready, Ian W. Scott, Chad Martin Stauber, Ted M. Erho, Robert David with the collaboration of �ric Bellavance, Francis Daoust, Marie-France Dion, Dorothy M. Peters, Hindy Najman, C. J. Patrick Davis, Lorenzo DiTommaso, Cecilia Wassen, and Craig A. Evans. 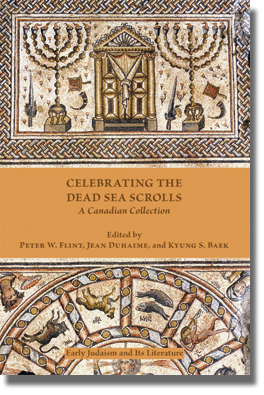 Citation: David M. Maas, review of Peter W. Flint, Jean Duhaime, and Kyung S. Baek, eds., Celebrating the Dead Sea Scrolls: A Canadian Collection, Review of Biblical Literature [http://www.bookreviews.org] (2014).